Easter in Morzine with the Mini Mavericks Crew! Kids club, Painting & an Easter Egg Hunt! Easter with the Mini Mavericks! Last week, Chalet Chambertin was full of Mini Mavericks. Experiencing the mountains for the first or second time – these are youngsters staying in the chalet experiencing their first dose of skiing or snowboarding, aged between 3 – 8 years old. Away from home, what better way to spend the week then an Easter themed Kids Club; based at our very own Hotel L’Aubergade. We had lots of fun making Easter bunnies, chicks and decorating lots of eggs for our Easter tree! Face painting and Lego construction was also a big hit after the kids lunch! On the last day of Kids Club we had an ‘Eggtastic’ day! As an arts and crafts enthusiast, Charlotte our chief Mini Maverick & Mountain Mavericks Nanny organised painting activities and everyone got very messy decorating eggs for the Easter tree! 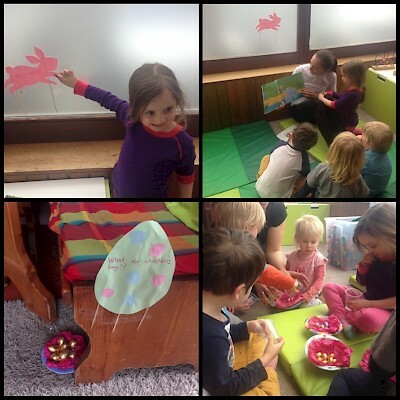 To end an ‘eggcellent’ week (sorry for the pun), we had a egg hunt, despite the poor weather! We hope everyone has had cracking Easter! We are taking bookings for next Easter now, with prices on our chalets section of our website. Get in touch with us now on thechalet@mountainmavericks.com for more information on all of our school holiday skiing dates. Previous: Supported Alpine Cycling Tours. Check out Velovation!